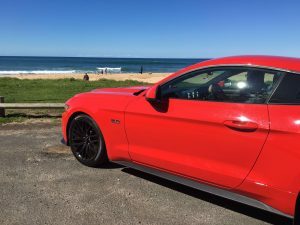 CAN THE MUSTANG MAKE IT AS A FAMILY CAR? 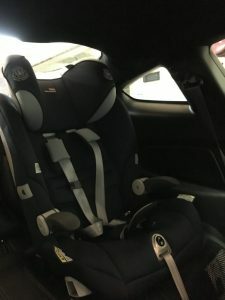 First of all, does the car seat fit for my son. Believe me, I was thinking about this for a long time, it was making me sweat. It had to fit, there was no way I would not let it fit. I took it out of our family friendly Focus, and paced nervously to the Mustang. First of all, I had to move the passenger seat as far forward as I could, then tilt I forward. Then, I approached the door with the seat, in it went, without a hassle. It clipped in, the anchor point was easy to reach and could be reached without too many issues despite my 6’2” frame. 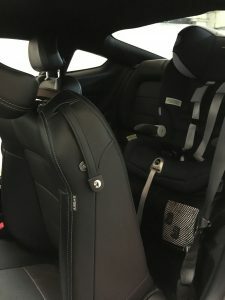 In a matter of moments, the seat was in and the Mustang was now a car fit for a family. I even tried the leg room in the passenger seat with the child seat behind it and was really comfortable for a two-hour drive. I even remarked that it was more spacious than the Focus. Next important feature for a family car is the boot space. Again, this will surprise you… it’s like the Tardis. 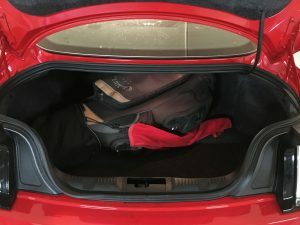 Once the boot pops open I was amazed by the space. It fit everything you could need for a family day out and there was space to spare. I even tried my golf clubs, as this is always a good measure as to how big the boot space is. The fit without a problem. The biggest problem about the golf clubs was that I realised I haven’t played for about 12 months. My swing will be a sorry sight! The final key area for a family is fuel economy, and let’s be honest, if you are just driving around the city, this is going to guzzle fuel. It’s a 5 litre V8, it’s not a surprise, it’s what you sign up for. 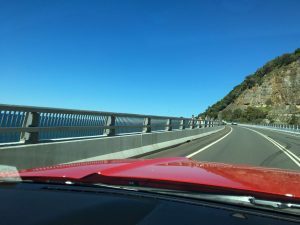 But when you’re on the open road, it’s fuel performance is actually pretty good and it’s pretty reasonable to fill the car up when you running close to empty. So what else is there to note, well the interior of the car looks every bit the muscle car it’s supposed to be. 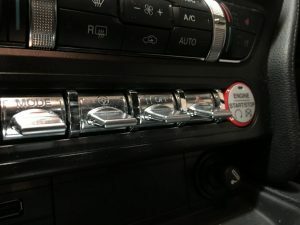 The details are spot on, the switches to change your drive mode/steering wheel settings/traction control and hazard lights are great, and look like traditional switches. Its good fun to play around with the settings too, you can really get a feel for the changes they make to the car. The seats are really comfortable, they feel spacious but have support in the right places. You’re not floating around or feeling uncomfortable when cornering. One thing that did surprise me was how loose the car was in wet conditions. I lost the rear end pulling out of a car park which got my heart racing. It was just a little flick of the rear, but enough to make me sit up and take notice. Let’s not forget, it’s a big engine with lots of power. You always have that feeling that it wants to go faster when you’re city driving, put it on the open road and it purrs. Any car with heated seats is a winner in my book, I’m the wrong side of 30 so I have aches and pains, I have a 3.5 year old son so I have extra aches and pains. They feel like such a luxury, and my wife loves them too, she suffers from back issues and sitting in a warm seat on a long drive has a better effect than a massage, except when you get out of the car into a cold wind and suddenly your arse is frozen! 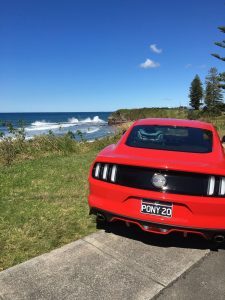 The good thing about the Mustang is that the heated seats are also COOLED seats for summer… BIG TICK Ford, well played. 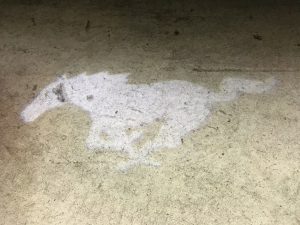 So onto the tradition things which I liked which don’t really matter when it comes to the performance of the car… My son loved the projection of the Pony on the floor when you unlock the car, yes it’s a bit cheesy, but he loved it and if I’m perfectly honest, I loved it too.